Anestis Karaousoglou related that at the time of the massacre of the Armenians by the Turks, about three hundred Turks had come to Farasa to loot and slaughter. 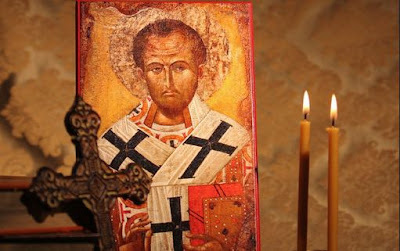 Hatzefendis [St. Arsenios] gathered all the women and children into the Chapel of the Panagia and said a prayer, and the ferocious Turks were unable to enter the village, because Saint John Chrysostom would not let them. The Saint appeared on the bridge they would have had to cross, stretched out his hands and stood in their way. (Above the ravine through which the river flowed was the little church dedicated to the Saint.) The Turks took fright and left when they saw the Saint driving them away, without letting them cross the bridge over the River Zamantis. The captain of the band of Turks, when he saw the Saint preventing them from crossing, said: "Let's get out of here quickly, because Saint John Chrysostom won't let us across." From the book Saint Arsenios of Cappodocia, Souroti, 1989, pp. 112.